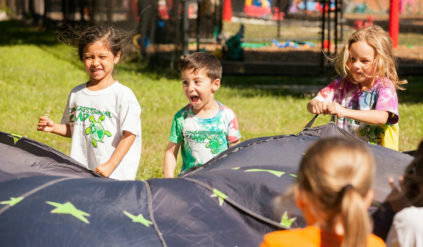 Welcome to Great Adventures, a fun and exciting program for campers 4 years old and extending to campers 5 years old, entering Kindergarten in the fall. Through our weekly themes, children meet new friends, learn to try new things and build their self-confidence. Past themes have included Space Race, Going Buggy, Jumping Jungle, Going Green and Carnival. This division of Congressional Day Camp also works in a close partnership with parents. We strive to ensure appropriate classroom placement and encourage communication about your child’s development over the summer. Campers who will be going in to Kindergarten in the fall of 2019, or will be 5 years old by October 31st, 2019 are also eligible for our Great Adventures Specialty Camps. Families can register for any number of combinations that fit their summer. We look forward to seeing your camper with us this summer! Classrooms: The classrooms used by Great Adventures campers include circle time rugs, dramatic play areas, blocks, fine motor manipulatives, and open ended art supplies. Children will use these centers during any free time throughout the day. Drop off/Pick up: Because of the young age of these campers, we invite you into our building to drop off your child every morning and help them situate belongings in their cubby before checking them in with their counselor. In the afternoon, children will gather in the cafeteria and be escorted to your car. Children arriving and/or departing on the bus will be escorted by a counselor. Rest time: After a full day of fun in the sun, all Great Adventures campers are given an opportunity to cool down and rest. Mats are provided for each child, and parents are welcome to bring in other rest time supplies such as blankets and a stuffed toy. Campers are not required to nap, but are asked to stay quiet for their friends who do want to rest. A quiet activity will be provided for campers who do not choose to rest after the first 30 minutes. 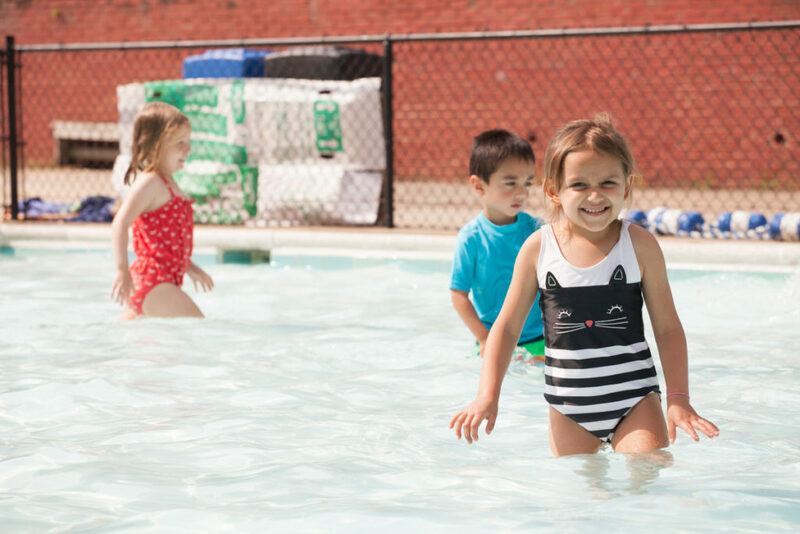 Swimming: Every day, the children enjoy splashing and playing in our wading pool. With a lifeguard on duty, a counselor in the water and another on deck, children are safe to enjoy some free water exploration in the 6” to 2’ pool. Some groups will be asked to arrive in their bathing suits for early pool time, but counselors will assist all campers in redressing after swimming. Ponies: Whether learning horse safety, how to groom, or riding Milo or Splash, children love to spend time with their furry friends. Every day, campers will have time with the ponies in a designated area near our building. Campers will learn horse safety, grooming and take pony rides throughout the week. 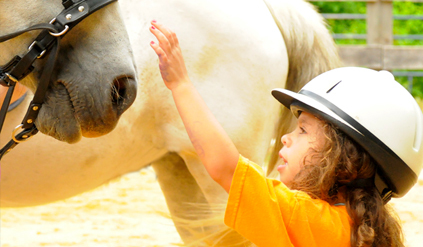 Counselors will assist children to wear the provided riding helmets and walk beside them during their pony rides. Art: Using an assortment of materials twice a week, campers will create individual and group art projects planned by our specialty teacher. These fun crafts will be tied into our weekly theme, and have included Classroom Robots, Tissue Paper Butterflies, and Olympic Rings. Science: Can we cook s’mores with just the sun? What’s the difference between a frog and a toad? How do you make a volcano erupt, or slimy flubber bounce? Twice a week, a specialty teacher will use the weekly theme to explore the world around us with fun stories, experiments, and activities.